The most beautiful aspects of festivals are that they initiate happy moods amongst people, even the ritualistic ones attain at least community participation with a zesty feeling all over. From participation to the celebration, festivals are beautiful carnivals, where people meet, greet and be lighthearted. Religion is a space, where humans live and foster the community belonging. It is the traditional aspect where community celebrates happiness in the form of festivals, and insecurities in the form of rituals. Being a pluralistic country, India caters to every community and their aspirations in terms of marvelous festivals. But the significance of Indian culture is that it is a scientific process towards human liberation and well-being. No other culture has looked at a human being with as much depth and understanding as this culture has. India is the land of various traditional order, some of the important ones are the Buddhism, Jainism, Vaishnavism, Shaivism and Shakti cult. Among them, Shakti traditions manifest themselves into varying forms, dependent upon the local society and their sensitivities. There are a lot of local festivals reclining in an important place in the societal ethos at the regional level.The base of these rituals is more or less dependent on the lifestyle of the people. Tamil Nadu is a state which gives tremendous importance to culture, traditions, and festivals with a fervor. One such important festival is Thimithi celebrated with much pomp in Tamil Nadu. Thimithi is a ritualistic act of walking on fire. This festival being into the Hindu fold is celebrated a week before Diwali, during the month of Aipasi according to Tamil calendar. 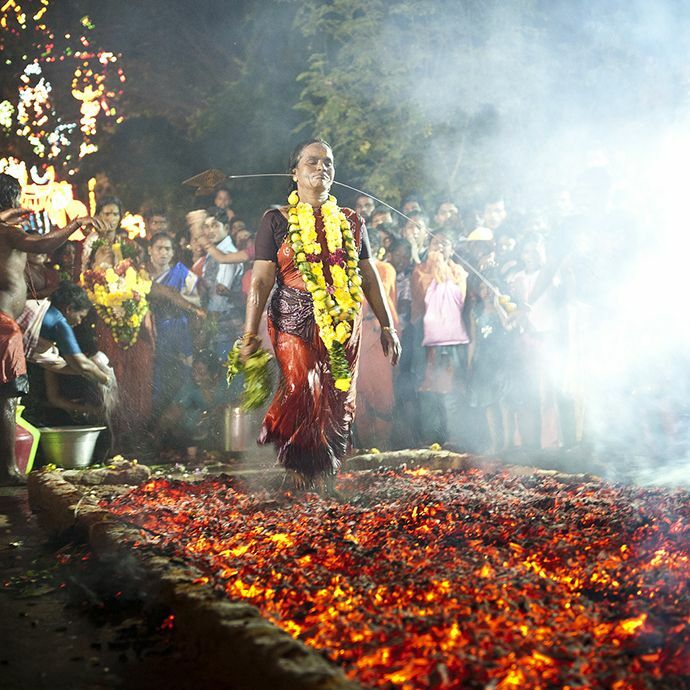 The fire-walking ceremony is in honour of Draupati Amman, who is considered the incarnation of Mariamman and is practiced not only in India but also in Sri Lanka, Singapore, Malaysia, Mauritius, South Africa and other countries with large South Indian populations. The festival is followed by enacting the excerpts of Hindu epic Mahabharata where Draupadi walked down the fire to confirm her prowess and chastity by sticking to the path of ‘Dharma’. India is believed to be celebrating Thimithi for more than 2000 years. Apart from the Draupadi story, the real meaning of this festival talks about the purificatory aspect of fire, or how it cleanses the ones who walk on it. Thimithi locally known as Poo Methipu , because of the color of the coal looks like heaps of Orange Flowers. This ritual is not gender based and is performed by both men and women. Sometimes even children take an active part in this ritual or they are mounted on the shoulder by either their mother or father. In Tamil Nadu, numerous villages conduct this annual event on a regular basis right in front of Mariamman (Goddess) temple. Devotees begin their ritual as early as 4 am and the event ends at 11 am. It is believed that if they are truly devoted to Draupadi they will walk through the fire unscathed. Superstitious beliefs exist in all cultures and religions and no country is free from this. In such queer beliefs, anxiety and fear psychosis are the driving forces. In some cases, trust is the major factor. This feeling makes a religion responsible for the well-being of its worshippers, as a culminating point of their devotion laden with desire.